Aimovig For Migraines Approved By FDA : Shots - Health News An antibody-based drug reduces the frequency of migraine headaches, according to data reviewed by the Food and Drug Administration. The agency approved Aimovig, priced at about $6,900 a year. 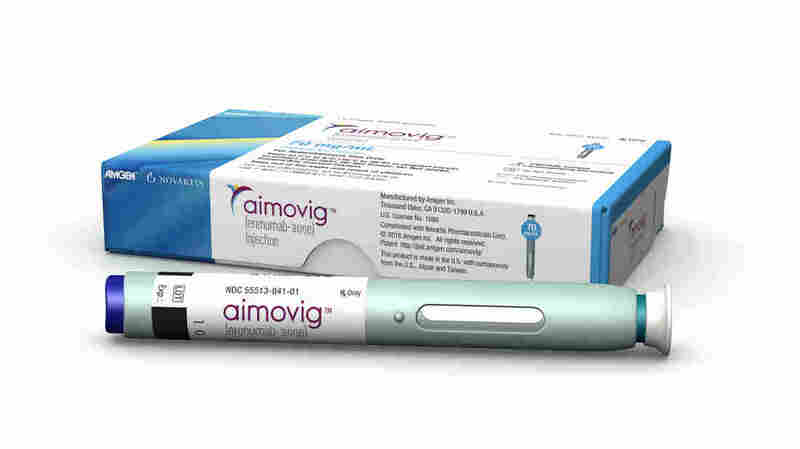 Aimovig, a new kind of migraine drug, is injected once a month. The medicine reduced the number of migraines in clinical studies reviewed by the Food and Drug Administration. That's welcome news to some of the millions of Americans who suffer from these potentially debilitating headaches. Much more common in women than men, these throbbing headaches can also come with nausea, visual disturbances and sensitivity to light. People who suffer them frequently sometimes find themselves anxious, depressed and even disabled. Most of the drugs on the market today are used to control the symptoms of migraine. The new drug, Aimovig was approved by the FDA on Thursday. It's the first medicine in a new class that's designed to reduce the number of migraines among people who suffer them frequently. The medicine, known generically as erenumab-aooe, is being sold by Amgen in the U.S.
Aimovig and several other migraine drugs in development are based on research begun in the 1980s. Scientists found people having migraine attacks have high levels of something called "calcitonin gene–related peptide," or CGRP, in their blood, as Lauren Gravitz reported for Shots in February. When the peptide was injected in people prone to migraines, it triggered headaches. People not prone to migraines were unaffected by the peptide injections. With this insight in hand, drugmakers worked to make antibodies to block the peptide's activity inside the body as a way to prevent migraines. In one of the large studies that set the stage for FDA approval of Aimovig, the number of migraines per month dropped from eight to fewer than five, on average. Patients taking dummy "placebo" shots also had fewer migraines. Patients in Aimovig studies reported generally mild side effects, though any long-term or rarer risks from Aimovig could come to light only over time. People inject the drug themselves using a pen-like device, like those used for insulin. Aimovig is an expensive type of medication called a monoclonal antibody. Antibodies are produced in living cells rather than in a chemical laboratory. Drugmaker Amgen says is has set the list price at $6,900 a year. Some analysts had expected the initial price of this drug to be set substantially higher – at $10,000 a year or more. But high prices have recently been generating political backlash, and some expensive drugs have fizzled after insurance companies sharply limited which patients they would cover. With the new migraine drug, those questions will come to the fore quickly, as Amgen says it's ready to put the drug on the market within a week, and has programs in place to help ease the cost to some patients.